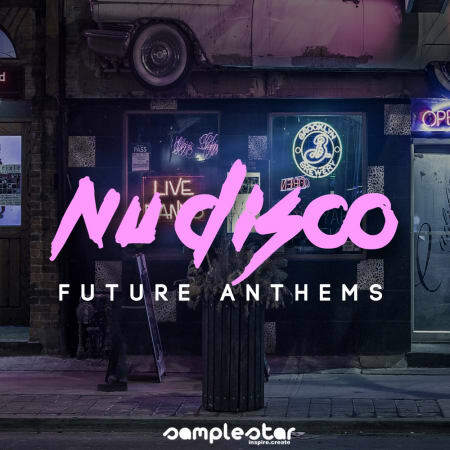 Samplestar are very proud to present Nu Disco Future Anthems! Retro neon melodics meet funked up contemporary rhythms in this first installment of Nu Disco Future Anthems. A brightly colored fusion of funk, disco and deep house fusing together uptempo synths, warm analog basslines and bright shimmering strats. We have also included midi files for all melodic content giving the end producer 100% control to change tempo, velocity or key and also customize the stems to your own exact requirements. • Full Song Starter Inspiration Kits> 5 huge key labelled track starter kits of combined Drums, Bass, Synth, Melodics & Vocals broken out into individual professionally mixed and mastered wav stems. (Includes full MIDI files). • Guitar Loops > 10 funk favoured guitar licks and rhythms. • 10 Synth & Music Loops. 100% Secure Express Checkout – No registration required! On a mobile device? Simply Buy Now and download later at your convenience. A download link will be sent to your email address immediately after purchase. * Currency conversion in US dollars ($) – including VAT related charges.